Winglets provide an alternative to buying a longer-range aircraft. They also tend to help aircraft sell faster and at better prices. The winglet features all sound good: less drag, lower fuel burn and superior climb and cruise characteristics. But what does that really mean to a CEO? I talked with Gary Dunn, Vice President of Sales at Aviation Partners, Inc. to find out. 1. Winglets provide an alternative to buying a longer-range aircraft. Operators who are pushing their aircraft to the edge of its capabilities might be considering an upgrade to an aircraft with better performance. With the extended range and improved fuel burn winglets provide, a different aircraft might not be necessary. “Blended winglets can offer a new aircraft at a fraction of the price,” says Gary. 2. Winglets improve aircraft performance. AviationPartners.com explains that winglets reduce drag on the wingtips, making them more aerodynamic. Falcon 2000 winglets improve fuel efficiency by 5% at .80M, and increase the range by up to 260 nm on 2000, EX, and EASy models. 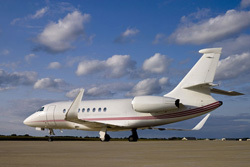 Hawker 800 winglets improve fuel efficiency by 7.3% and boost the range by 180 nm. 3. Winglets improve resale value. They are becoming a standard, a piece of equipment that buyers expect, says Gary. It’s a highly visible technology, and aircraft with winglets “sell more quickly at better prices.” The residual value for the upgrade is a conservative 75%, he says, although higher residual values have been observed at resale. 4. Winglets are environmentally conscious. AviationPartners.com says its Blended Winglets have cut CO2 emissions by more than 22.5 million tons, and have already saved more than 2 billion gallons of jet fuel for business and commercial operators worldwide. For factors to consider when assessing the value of a winglet modification, look for next week’s winglet blog post.